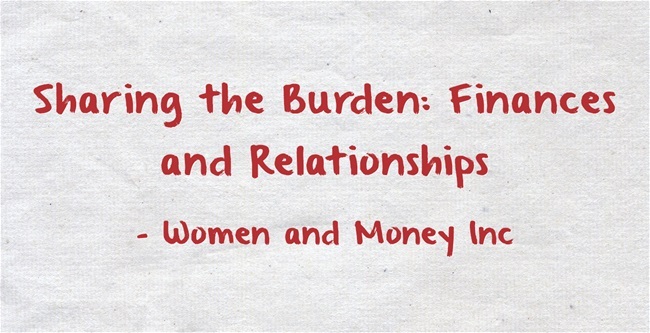 Sharing the Burden: Finances and Relationships - Women and Money Inc. In previous decades, men and women had very different social and familial roles. Men worked outside of the home to provide for their families, and women maintained the household and raised the children. Nowadays, most families require two incomes to run a household. The changing social and cultural roles of men and women have altered our financial lives, too. Traditionally, women may have assisted with the finances, but it was mainly men who made the majority of the financial decisions (when to buy big ticket items, for example). Today, I have found that both men and women are in charge of the finances, but never at the same time. Usually one partner assumes responsibility for the inflow and outflow of cash and the other partner remains oblivious. In modern day relationships, there seems to be some discussion about finances and a bit of transparency; however, it is usually not accurate to say that a couple is ‘on the same page’ financially speaking. Why does this happen? As mentioned above, it is not uncommon for one partner to be in charge of the finances. I believe that this is positive and necessary for the sake of efficiency and consistency; however, this doesn’t mean that I advocate for one partner to have total financial control in a relationship. In my experience, it is good to have one partner in charge of bill payments, cash withdrawals for household expenses, reviewing bank statements, and the like. If one partner oversees all of these things, then there is one system in place. A distinction occurs between a financially strong or weak relationship when the partner in charge of the finances doesn’t include their spouse, or, their spouse doesn’t actively seek out opportunities to be included. Each partner should be aware of their roles and responsibilities within the financial relationship – this means that although one partner doesn’t have to actually pay the telephone bill, they know the amount that it costs per month, they have online access to the joint accounts, they know the bank account balances and when the mortgage payment should be withdrawn. Total transparency means that although two people have different roles, they are completely honest with each other. And, herein lies the real issue. I have worked with many couples who cannot seem to cultivate honesty in their relationship – with each other or with themselves. I meet people who are in denial about their spending habits, how much debt they have, their financial weaknesses. I speak with couples who keep secrets from each other, financial and otherwise. Sometimes it feels like the one last taboo in a relationship is debt. Honesty is telling your partner when you’ve reached your limit for what you are comfortable with financially – the trouble is, many people either can’t admit it to their partner or their partner isn’t listening. It is easy for one partner to assume the entire responsibility for the money onto their shoulders. However, is it healthy? No! In my experience, when one partner must oversee every aspect of the couple’s finances and make all of the decisions alone, the stress drives the couple apart. The one individual feels like they are forced to be responsible for it all, while the other person claims ignorance. If the finances go awry, the one partner who is in charge feels completely at fault and guilt sets in. The other partner who has financially checked out is usually happy to blame their partner – “She spent all of our money and I didn’t know!” or “He has a spending problem and I didn’t realize it until now!” Of course, there are warning signs to most financial behaviours, but first you have to be paying attention in order to see the signs. The challenge with having one person in charge of the day to day aspects of your finances is that it can often morph into that person having sole responsibility for all of the decisions. The partner who is not in charge of the ‘paperwork’ aspects of the finances should take an active interest in the couple’s money. Ask questions, review bills, check in to your online banking. Be supportive, discuss strategies for financial progress, and suggest ways to improve or change spending habits. Don’t bury your head in the sand, ignore the issues, and then claim that it was the other person’s fault. By suggesting (or sometimes insisting) on financial communication and transparency, you are offering your partner support and being proactive, just in case any spending issues arise. If your partner mistakes your interest as distrust, you may have deeper issues than just the money. Financial issues also can arise if you have married or are in a relationship with someone who has a different money style than you. This is a separate issue that I will save for another article in the near future. Money styles (spender vs. saver, debt vs. no debt, etc) can have a deep impact on relationships, maybe more so than any other financial factor. Maintaining the finances is just like any other aspect of a partnership – without adequate attention, there is no way that it will be successful. By recommitting to your partner, setting financial goals together, and keeping open communication about your finances and spending habits, you will see drastic changes in how you interact with each other in all areas. Always remember – relationships, just like finances, are never easy. In your opinion, what are the cornerstones of creating a solid financial foundation in a relationship? What do you think are common pitfalls for couples today? Let us know!